Edwin Drake, right, stands with friend Peter Wilson of Titusville, Pennsylvania, at the drilling site – but not the original cable-tool derrick – of America’s first oil well. Photo courtesy Drake Well Museum. The American Oil & Gas Historical Society frequently updates AOGHS.ORG content with new articles as part of its energy education mission. The society maintains a communication network of petroleum museums, teacher workshop programs, county historical societies, and similar organizations. To help preserve U.S. petroleum history, the society documents exploration, production, and transportation milestones. It also tells the many stories of generations of “oil patch” families. Contact the society with your suggestions for articles, comments – and much-needed financial support. The domestic petroleum industry that began in 1859 with a well drilled just 69.5 feet deep forever changed America’s economy, standard of living, and culture. The earliest exploration companies began seeking oil for refining into a newly invented lamp fuel called kerosene. This “rock oil” fuel was cheaper than whale oil, and far safer than the more popular but explosive fuel, camphene. As more states joined Pennsylvania in becoming “producing states,” the political landscape changed as fast as exploration technologies. Early energy issues included need for an infrastructure for producing, storing, and transporting oil and natural gas. As discoveries grew, the rush for “black gold” resulted in complex economic issues on a national scale, including wasteful over-production, sudden collapses of oil prices, questionable stock promotions, and frequent boom-and-bust cycles. The industry also faced a major challenge just as the improved science of petroleum geology began finding mid-continent oilfields. Thomas Edison invented the first commercially practical incandescent light in 1879, threatening the oil industry’s principle product, kerosene. Demand would continue for other refined products (see vaseline and axle-grease). Fortunately for exploration and production companies, automobiles powered by an internal combustion engine required what had been a refinery byproduct: gasoline. The first U.S. auto show took place inside New York City’s Madison Square Garden in November 1900. Less than two months later, an oil gusher at Spindletop, Texas, launched the modern U.S. oil industry. The coming century would bring far greater challenges for petroleum and the world. American oil history begins in a woodland valley along a creek in remote northwestern Pennsylvania. Today’s U.S. petroleum exploration and production industry is born on August 27, 1859, near Titusville when a well specifically drilled for oil finds it. A former railroad conductor drilled it for New Haven Connecticut investors. Even more early petroleum history came on the banks of Oil Creek: First Oil Well, First Oil Well Fire. The 1901 “Lucas Gusher” in Texas reveals the Spindletop oilfield, which will produce more oil in one day than the rest of the world’s oil fields combined. The Prophet of Spindletop – self-taught geologist Patillo Higgins – had founded the Gladys City Oil, Gas & Manufacturing Company in 1892 near Beaumont, Texas. Traces of natural gas had been found in Alabama in the 1880s, and gas was being supplied to Huntsville as early as 1902. Although tar pits had been reported in the 1850s, Alabama’s oil industry began when its first oilfield was discovered on February 17, 1944, by Texan H.L. Hunt, who drilled the No. 1 Jackson well in Choctaw County. The first Alaska oil well with commercial production arrived in 1902 in rugged territory where oil seeps had been known for years. Drilled using cable tools in 1902, the first Alaska oil well proved production was possible in the territory – but difficult and costly to transport. The Alaska Steam Coal & Petroleum Syndicate produced the oil near the remote settlement of Katalla on Alaska’s southern coastline. The oilfield there also led to construction of Alaska Territory’s first refinery. Arizona became a petroleum-producing state in 1954 with a natural gas well drilled by Shell Oil Company. The first significant oil production arrived in 1959 with a well completed by the Texas Pacific Coal and Oil Company. Apache County in the northeast corner of the state remains the only petroleum-producing county. 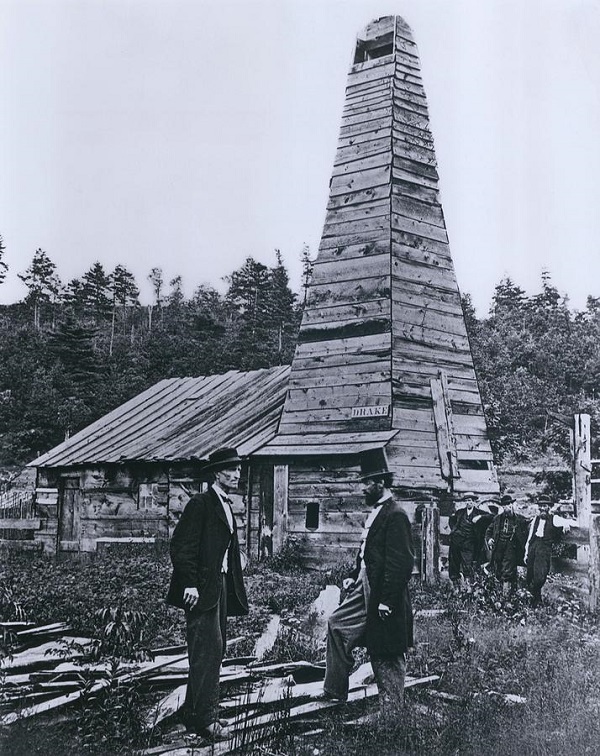 Following the August 1859 oil discovery in Pennsylvania, the young U.S. petroleum industry reached the West Coast in the late 1870s with the first California oil well. After drilling three wells beginning in 1875, California Star Oil Works struck the Golden State’s first oil gusher with the fourth well. The discovery would help create a major oil company. While drilling for natural gas drilled on a garden plot belonging to T.J. Norman, a local blacksmith, the Norman No. 1 well found oil instead. Although the 1892 well of William Mills was a small producer in Neodesha, Kansas, it was the first major petroleum discovery west of the Mississippi River. On September 12, 1866, Lyne Taliaferro Barret brought in the first Texas oil well. His Nacogdoches County discovery produced just 10 barrels a day and failed. It lay dormant for nearly two decades until 1887 when others return to the small but historic oilfield. The first Texas oil boom arrived in the summer of 1894 when the Corsicana oilfield was discovered by a drilling contractor hired by the city to find water. Technological innovations would follow, including rotary drilling. Corsicana residents annually celebrate their town’s oil patch heritage with a Derrick Day Chili & BBQ Cook-Off. In 1901, the first Louisiana oil well revealed the giant Jennings oilfield and launched the Pelican State’s petroleum industry. Hundreds of thousands of wells have been drilled since. The first Mississippi oil well was drilled in 1939 after a Yazoo County survey by geologist Frederic Mellen, who had sought a suitable clay to mold cereal bowls for children. Union Producing Company completed ithe Woodson No. 1 at Tinsley, a few miles southwest of Yazoo City. The well produced 235 barrels of oil a day from a depth of 4,560 feet from a sandstone later named the Woodruff Sand. While working on a Works Progress Administration project, Mellen had found indications of a salt dome structure. The first publicized report of oil in Nebraska had been in an 1883 newspaper. After more than a half century of dry holes, Nebraska’s first commercial oil well was completed in the southeastern corner of the state. The Pawnee Royalty Company made the 1940 discovery west of Falls City in Richardson County. After nearly half a century and 85 dry holes, Nebraska’s complicated geology finally yielded a producing oil well. On February 12, 1954, Shell Oil Company completed the first commercial well. Shell’s Eagle Springs No. 1 found oil in Railroad Valley in Nye County. New Mexico’s first commercial oil well is drilled September 25, 1922, on the Navajo Indian Reservation near Shiprock by the Midwest Refining Company. The Hogback No. 1 well is a modest producer at 375 barrels per day, but Midwest soon drills eleven additional wells to establish the Hogback oilfield as a major producer of the San Juan Basin. After decades of dry holes drilled from one corner of the state to the other, in 1951 new technologies and determination – true grit – brought North Dakota’s first oil discovery. The exploratory well on the farm of Clarence Iverson northeast of Williston endured blizzards and was “shot” several times before finally producing oil on April 4, 1951. At 3 p.m. on April 15, 1897, in Indian Territory, George Keeler’s stepdaughter dropped the “go devil” down a well bore to set off nitroglycerin. A crowd watched as the explosion caused the Nellie Johnstone No.1 well to blow in as an oil gusher. Drilling had begun in January, the same month Bartlesville was incorporated – and a decade before Oklahoma became a state. After decades of frustration over failed exploration attempts, the first Utah oil well was competed on September 18, 1948, in the Uinta Basin. “The honor of bringing in the state’s first commercial oil well went not to the “Majors” but to an “Independent,” the Equity Oil Company,” notes one Utah historian. Tales of a Wyoming “tar spring” would inspire Mike Murphy of Pennsylvania to drill the state’s first significant oil well in 1883. Civil War veteran Philip Shannon explored more of the Salt Creek oil seeps outside of Casper. But the story of Wyoming’s oil patch really begins with Washington Irving. Explore more posts: John Wilkes Booth and Dr. Seuss were once in the oil business; Maybelline cosmetics, Hula-Hoops, nylons, and Wax Lips were all petroleum product offspring; Harry Houdini patented a deep sea diving suit adopted by offshore drillers; “fracking” was the profitable brainstorm of a cashiered Union veteran; Florida’s first oil well was drilled after the state offered a reward; and countless thousands of obsolete stock certificates fascinate collectors – each has a tale of its own.